When planning our summer gardens, homegrown tomatoes get all the glory. Pages and pages of tomato varieties fill catalogs, centerfolds of lush summer fruit. But potatoes deserve more love. Once you've grown your own potatoes, you'll never want to eat bland store-bought spuds again. Honestly, why choose run-of-the-mill Russets when you can feast on French Fingerlings or savor Sangre? Along with beautiful, delicious varieties enticing you to grow your own, you also can harvest early to enjoy new potatoes, while allowing the vines to continue to produce larger potatoes for late season enjoyment or storage. When I first considered growing potatoes, I worried that the crop would occupy too much space in our garden. After all, our kitchen garden's sunny space is at a premium, since our property is heavily forested. So, for my first attempt at growing potatoes, I chose to use Grow Bags. Grow Bags are fabric bags that function like a pot, allowing you to adjust the height by folding down the sides, and then unfolding them and adding soil as the plants grow. The beauty of Grow Bags is that water easily drains through the bag, helping to avoid soggy soil. The fabric bag allows good air circulation, helping regulate soil temperature. Additionally, the bags can be positioned on patios, balconies, or any sunny patch in your garden. I place our bags strategically to capture as much sun as possible. Last year, with the construction of the raised beds for our kitchen garden, I decided to devote one of the beds to potatoes. Everything began beautifully. Perfect soil, lovely sprouts, and then suddenly--the vines died. Yes, I didn't think about adding a bottom layer of wire mesh when building the raised beds to keep out my arch nemesis...the vole. I know better, too. Those nasty creatures ate every potato. Decide which varieties to grow and order early. Seed Savers Exchange, Sow True Seeds, Territorial Seeds, and Grow Organic are a few excellent sources for seed potatoes. You can also find seed potatoes in your local feed and seed shop. Some gardeners pooh-pooh the purchase of seed potatoes and use sprouted potatoes from the pantry. However, certified organically grown seed potatoes help reduce the risk of diseases in your crop, plus you'll know that you're planting potatoes that are chemical-free. If you're planting potatoes in bags or containers, you may want to recruit a friend to share seed potatoes so you can have a good variety without incurring too much expense. One pound of seed potatoes can yield approximately 10-15 pounds of potatoes to harvest under ideal conditions. In our zone 7b garden, St. Patrick's Day is considered a good time to plant potatoes. Generally, late winter is ideal for planting, as potatoes will tolerate light frost. Hard freezes, though, will delay growth and can damage vines. Potatoes prefer a cool spring with adequate moisture and soil temperatures between 60-70 degrees. Tubers don't form when soil temperatures exceed 80 degrees, so plant early. Fold the sides down on your Grow Bag, making a 4 inch cuff. Fill the bag with approximately 4 inches of high quality soil. Potatoes thrive in soil with a pH between 5.8 and 6.5, so a soil test is always a good idea. They're heavy feeders, preferring a soil rich in phosphorus. As the potato vines grow, maintain a good watering routine, particularly when blossoms form. Remove any weeds, which should be minimal in Grow Bags or containers. 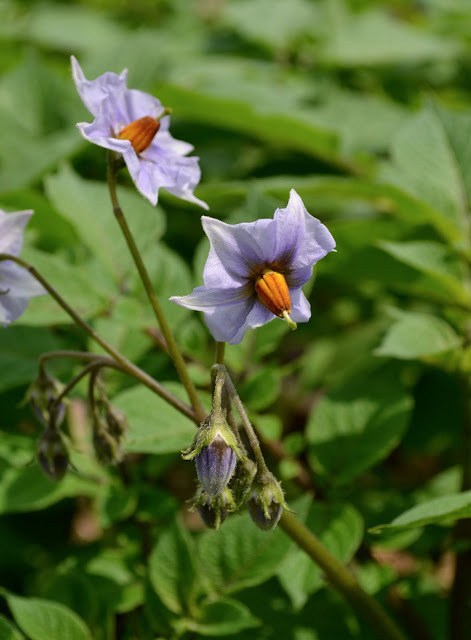 As the vines reach approximately 8 inches in height, add an additional layer of soil over the potatoes to avoid exposure to the sun, which causes scalding/green potatoes. Green parts of potatoes contain an alkaloid that's poisonous, causing the potato to taste bitter. Remove any green portions of potatoes before using. Potatoes mature approximately 100 to 120 days after planting. If you want to eat fresh new potatoes, you can harvest a few small early potatoes, leaving the vines intact for continued growth. After the vines have died, it's time to harvest the main crop. 3. Add potatoes and cooked bacon, salt and pepper, stirring in skillet to mix bacon into potatoes well. 4. Form potatoes and bacon mixture into a large “cake” in the skillet, allowing the mixture to brown well, approximately 8-10 minutes. 6. Allow second side to brown, approximately 5-7 minutes. 7. Slide onto plate and serve. Really...you need to plant potatoes, just so you can enjoy Rösti. This post was shared with Wildcrafting Wednesday. Check out some other great blogs and ideas here. 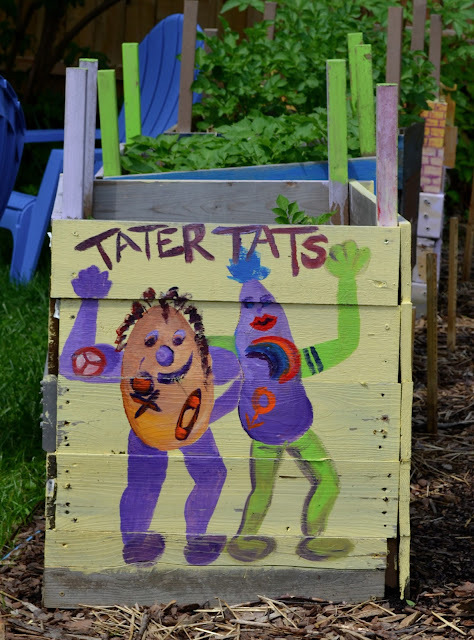 Part of the Backyard Farming Connection blog hop!